Feni Ali scored a goal in each half as URA shocked home side Simba in their first match of the CECAFA Kagame Cup played on Sunday evening at the National Stadium in Dar es Salaam. Playing under pressure from their demanding home fans, Simba knew only too well that they needed an early goal to calm their nerves and cool down the pressure. Five minutes into the match the red Simba army had their first chance of the match with Zambian Felix Sunzu unleashing a heavy shot from the right but was saved by keeper Yassin Mugabi. Simba were enjoying possession of the match stringing up to ten passes but URA still maintained their calm and planned their attack. The Ugandan tax men finally broke the deadlock in the 11th minute through Feni Ali who headed in a strong header from 15 yards catching Simba keeper Juma Kaseja flat footed. 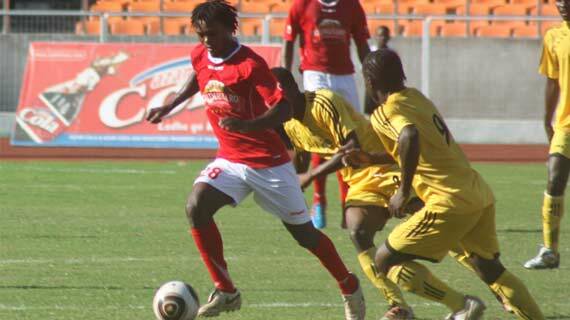 URA then cooled down the tempo with Simba doing much of the chasing as more pressure mounted on their shoulders. Musa Mudde who joined the Reds from Kenyan side Sofapaka had a rasping shot saved by Keeper Yasin after dribbling through the centre and changing gears to the right. Danny Mrwanda also had a decent effort going wide from the left but still nothing was forthcoming. Mudde had another chance in the 38th minute with his trademark shot against his countrymen but Yassin the URA keeper still proved to be on the mark with his job. With support on their backs from Yanga fans, URA took full control of the match and strolled around Simba as they kept their patience with no hurry for attack. They managed to wade off the marauding Simba for the entirety of the first half. Simba thought they would grab something in the second half and begun on a high. They chased every ball but could not be able to close down the gaps when they lost possession. URA almost caught them on the counter twice with Nsumba Augustine’s shot going over and Manaaba Allan’s free kick being saved. Simba had a great chance in the 53rd minute but Abdallah Juma’s header was saved by the keeper but this tall striker should have done better with no defender putting the pressure on him. Danger man Robbert Ssentongo almost made it two in the 60th minute capitalizing on a defensive blunder, but Juma Kaseja saved his shot for a corner. Feni Ali completed his brace with two minutes left to spare for the match, further breaking the hearts of the thousand of Simba fans inside the Stadium. URA now go second in their pool behind Vita Club of Congo who routed Djibouti’s ports 7-0.